We all believe that we know what twins are. They’re similar. Identical hats, identical jackets, identical bags… Only a mother may say who is who. But if you ask this very mother, she is sure to say that actually her kids are absolutely different, both in terms of appearance and traits of character. And our today’s post is dedicated to such twins. They are lucky to have separate rooms and you’d be surprised to find out how similar and different their interiors are. 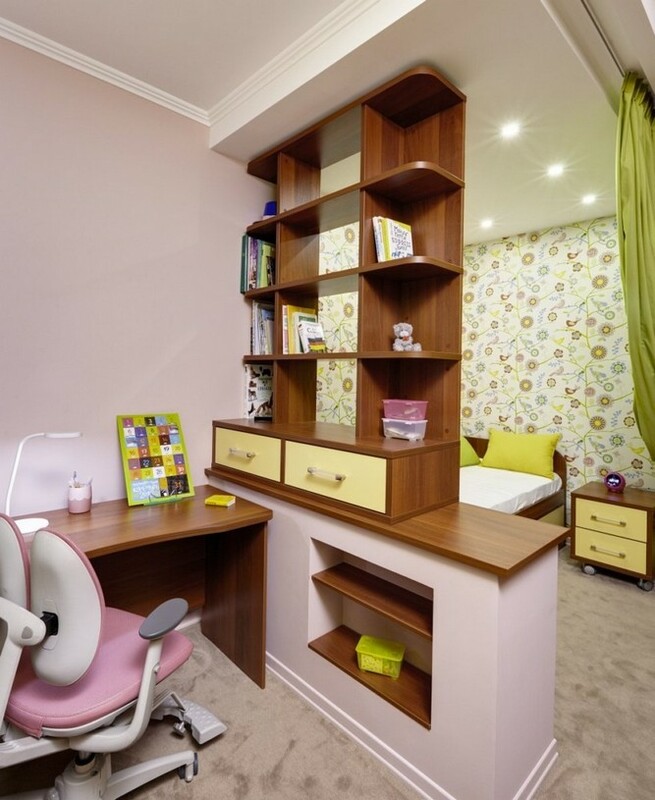 The mother of the twins is a child psychologist, no wonder she took the issue of her girls’ rooms’ interior design very seriously. For a start the designer she hired heard a detailed report on all the differences between those sweet 9-year-old girls. The summary of the interview was as follows: the rooms should be absolutely different. 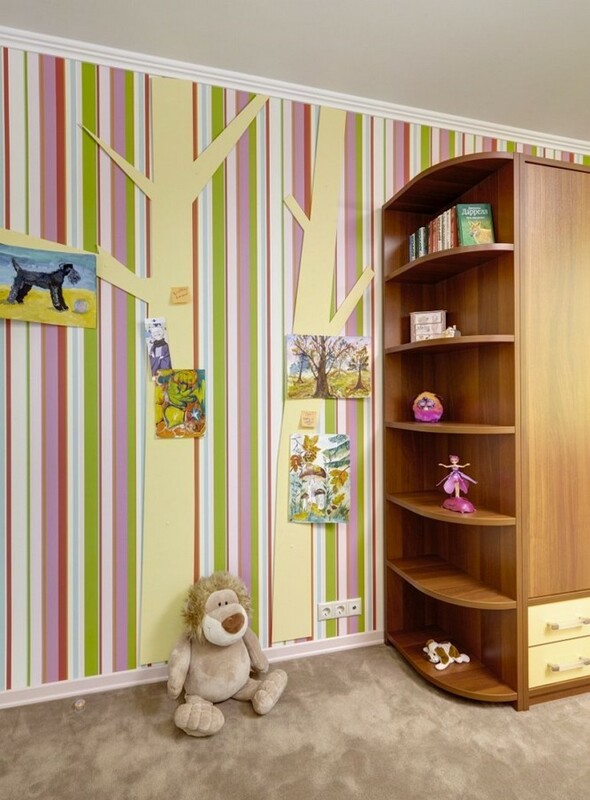 The author of this project always begins the design of rooms for kids by choosing furnishing, since her experience proves that ready-made furniture as a rule appears to be cheaper than a similar custom-made piece. Contemporary manufacturers offer a wide range of well-thought-out sets of furniture that are ready for use. 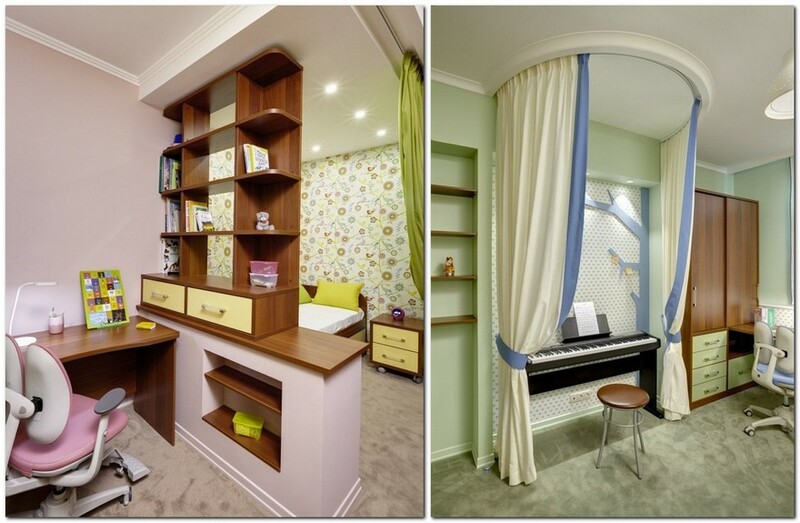 Such as this corner wardrobe combined with a transforming desk. When it came to choosing the furniture, you can’t imagine how surprised the designer was to find out that both girls opted for the same collection! Further it was the similar story with the wallpaper. Eventually it was clear that the task has changed a little bit: now the author had to create two different interiors, but in similar style and based on the same collections of furniture and wallpaper. The choice was set upon the Yet Jet Collection by Prestigious Wallcovering, the USA. This collection is very bright and colorful. Its predominant motifs are flowers and birds, as well as a few options featuring stripes and polka dot patterns. 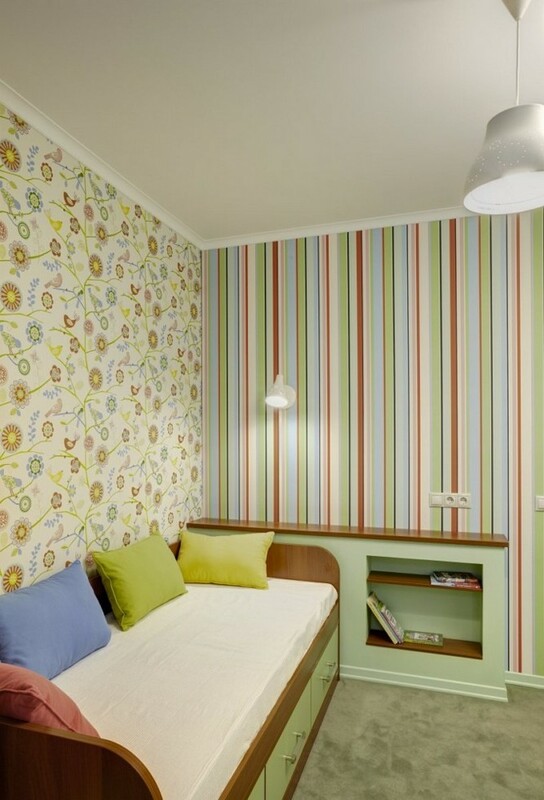 Colorful wall coverings were somewhat diluted with plain painted walls. One of the girls wanted to see more pink, and the other set her heart upon shades of green. 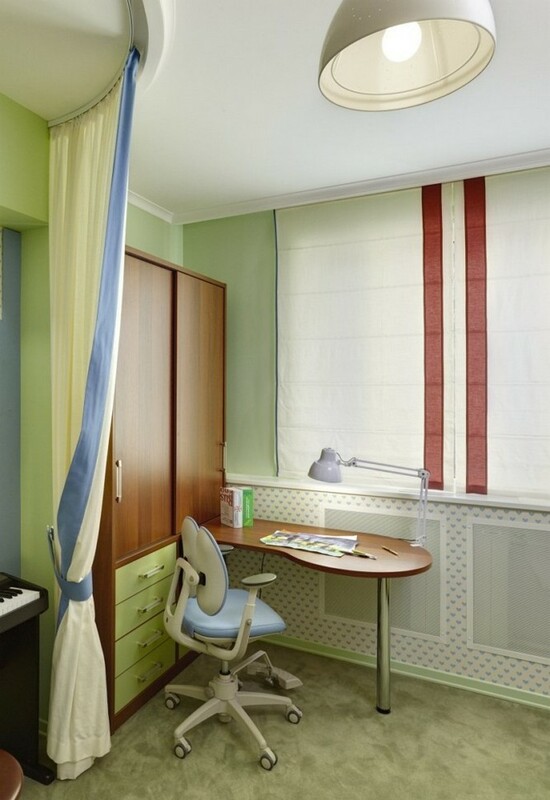 The hostess of the pink room enjoys privacy, so her bedroom area is separated from the study zone with see-through bookshelves, and the bed can be easily isolated with a green interior curtain. 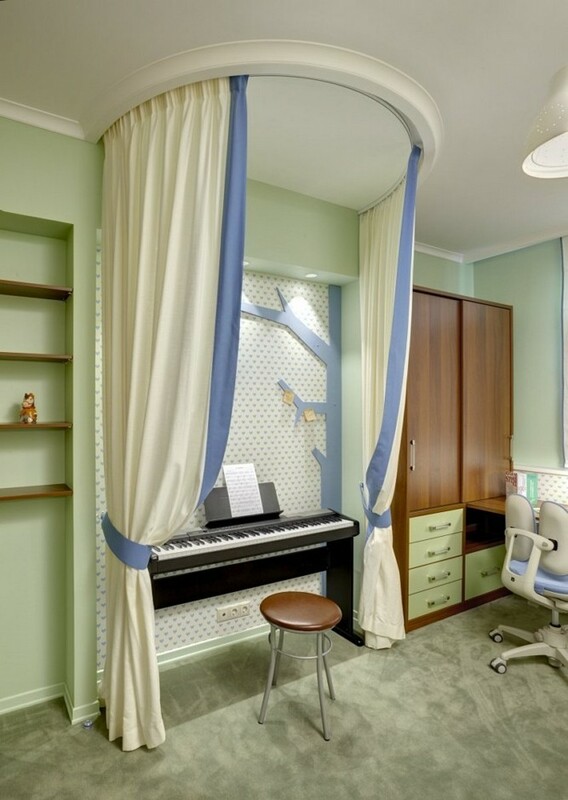 Her sister, the owner of the green room, is a fan of music and small home performances. So, her room was equipped with a semi-circular curtained module resembling a makeshift stage. 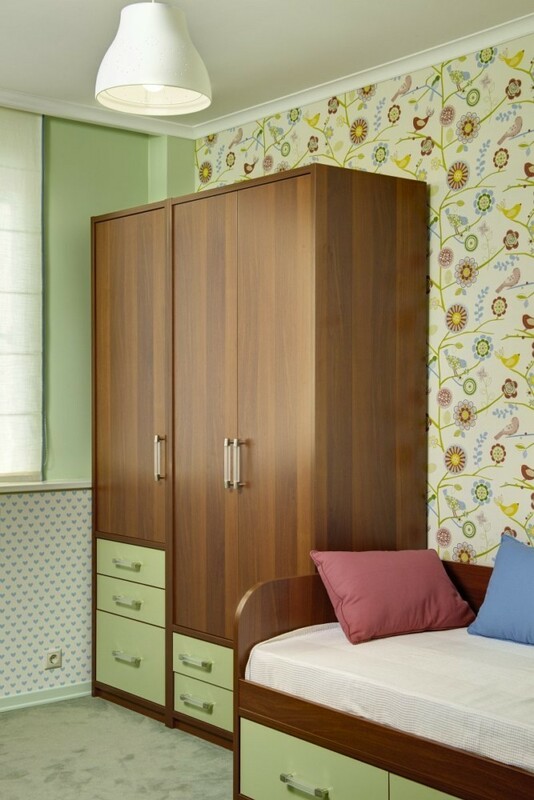 Both rooms feature flat plywood trees for displaying creative works of girls, as well as roomy wardrobes and shelving units for storage.